In order for chemically reactive functional groups to be suitable for bioconjugation, three basic features are of high importance: reactivity, chemoselectivity, and biocompatibility. The first of these – reactivity, is clearly a prerequisite for applications performed under highly dilute conditions, for example, protein – protein conjugations. Protein – protein conjugations are often constrained to low protein concentrations (e.g. <1 mg/mL) due to limited availability of proteins and/or associated cost factors. Another important bioconjugation feature for reactants is that they be chemoselective. Namely, selective reactivity with each other while in the presence of a rich milieu of other biological functional groups (e.g. amino (–NH2), carboxyl (–COOH), and/or thiol (–SH)). This important feature is often overlooked, however, lack of selectivity is the driving force behind self–conjugation (homodimer formation) via unwanted and non–selective intramolecular interactions. Lastly, it is important that chemically reactive functional groups be biocompatible. It is crucial for ligation reactions to proceed under mild aqueous buffer condition compatible with biological molecules, without the need for catalytic reagents (e.g. Cu(I)) that are highly toxic to biological systems. Bioorthogonal chemical functionalities must remain highly reactive but stable during long – term aqueous storage, while remaining inert to high concentrations of other biological functional groups. Unfortunately, only a few chemical transformations meet these strictly defined conditions: reactivity, selectivity, and biocompatibility. Consequently, only a small subcategory of chemical transformations are suitable for bioorthogonal ligation of highly functionalized biomolecules (e.g. proteins, nucleic acids, and sugars) in aqueous, pH neutral environments at ambient temperatures while still preserving biological function. The choice for a particular ligation strategy suitable for a specific application is based on different factors. The use of copper–catalyzed azide–alkyne cycloaddition reaction (CuAAC) is limited to applications where the toxicity of copper is not important (e.g. peptide or oligo modification, or cell lysate labeling). In this respect, strain–promoted alkyne–azide cycloaddition reaction (SPAAC) is better suited for bioconjugation since no catalyst or additional reagents are required. 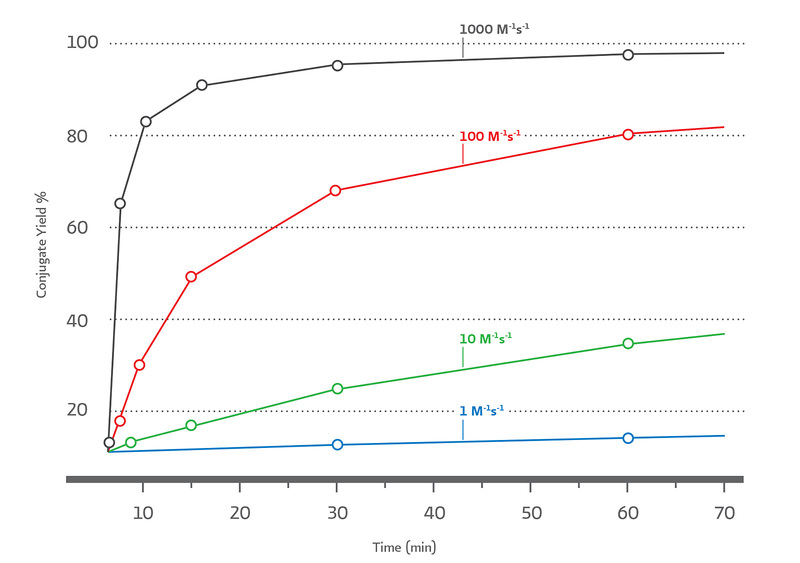 However, reaction rates of SPAAC reaction are inherently low (e.g. 0.1 to 0.9 M–1s–1), limiting their use to relatively high concentration applications (e.g. 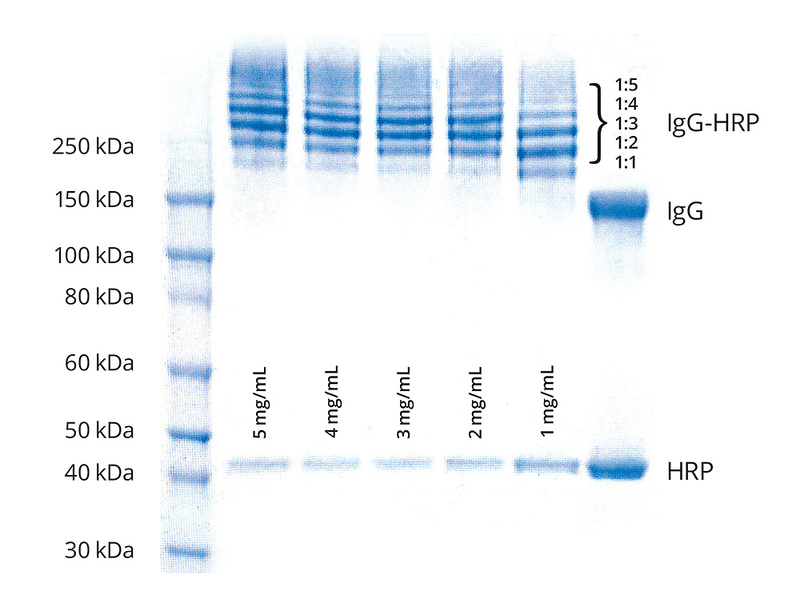 protein–small molecule conjugations, cell labeling). For applications at low biomolecule concentrations (e.g. < 5 μM), the inverse–demand Diels Alder ligation pair trans–cyclooctene–tetrazine (TCO–Tz) are the pair of choice. The chemoselective TCO–Tz ligation pairs possess ultrafast kinetics (> 800 M–1s–1) unparalleled by any other bioorthogonal ligation pair. The combination of ultrafast kinetics, selectivity, and long–term aqueous stability make TCO–Tz the ideal pair for low concentration applications such as protein–protein conjugations. • Tetrazines and TCOs are not readily accessible but commercially available.